Image created courtesy of THE BRITISH LIBRARY BOARD. J.W. Ainsworth opened the Capitol Theatre, Scarborough, he played in the Bradford area for many years. Wilfred Ainsworth was playing at and broadcasting from the Gaumont Palace, Middlesbrough, 1936 to 1938. He also broadcast from the Gaumont, Newcastle in 1937.
at the Granville Theatre Walham Green in 1942. Joyce Alldred started her musical career in her native town of Hyde in Cheshire, UK, taking piano lessons, from the age of seven. During her teens the pull of the pipe organ saw her taking lessons at the organ of Flowery Field Church. Joyce's interest in the Theatre Organ was as a result of a visit to the Regal Cinema in Harrogate, Yorkshire. Some years later due to the kindness of George Baker, General Manager of the Gaumont Theatre, Manchester, Joyce had use of the Theatre`s 4/14 Wurlitzer for practice. This eventually led Joyce to taking lessons. Her Theatre Organ playing started with the ABC Minors Matinees at the Apollo, Ardwick, Manchester, and the Children's Matinees at the Odeon, Sale, Manchester. Joyce often played at Theatre Organ Club and Cinema Organ Society meetings throughout the country, travelling by train and bus to reach venues as far away as London and the South Coast. Joyce was among the first members to join the C.O.S after its inception in 1952 by her teacher Hubert Selby. Over the years Joyce Alldred has played many of the fine theatre organ installation in the UK prior to the wreckers ball demolishing the theatres and the organs being sold for scrap or broken down to enlarge other instruments. Sidney Stephen Amos was born on the 12th Nov 1910 in Ashford, Kent.
. First appointment aged 13. Conducted the Ashford Male Voice Choir at the age of 18. Church appointments St. Paul’s, Ashford; St. Peter and Paul’s, Headcorn. Sidneys first theatre organ appointment was at the Capitol, Tonbridge then the Granada, Dover. After five years he left Dover and went to the Majestic, Reigate. Joined Gaumont British in August 1945, playing at Plymouth and Chadwell Heath leaving Gaumont in April 1946 to go freelance. Sidney Amos died February 1994. In 1960 she was in Southend 0n Sea playing at the Palace Bars. In 1976 playing for a variety show at the Embassy Skegness. Albert E. Askew opened the Rialto Cinema Bebington. Alan Atherton studied both classical piano and classical organ and obtained the diploma ALCM separately for both instruments. The love of playing theatre organ has been with him since his father took him to watch Ernest Broadbent play the Mighty Wurlitzer at Blackpool Tower, but it has only been recently that he has been able to persue his ambition to perform the theatre organ publicly. Alan has played church organ from being 14 years old and has adapted his classical 2 feet pedal action to suit the theatre organ, this can be seen in action on Alan's Youtube channel. Playing for the church has given him the opportunity to play many different pipe organs including Liverpool Cathedral, St Georges Hall and St Andrews Parish Church, Jerusalem. Cecil G. E. Atkinson was born 11th April 1910. Joined Gaumont British in Scotland in 1932, transferring to London in 1935. Left to go to the Regal, Cambridge in 1937. Served in the Beds and Herts regiment 1940-1944. Returned to play at the Regal Cambridge after being demobilised. Martin Atterbury profile will be updated when information becomes public. My Wish For Christmas Played on the Wurlitzer in The Opera House of The Winter Gardens in Blackpool, Lancashire. Stephen Austin was born in 1952 in Taplow, Buckinghamshire and spent the next 21 years living around the home counties during which time he studied piano and classical organ in Essex to Grade 8. On leaving Shenfield High School 6th form, Stephen was offered a position at Hammond Organ UK in Edgware on the recommendation of Ena Baga whom he had come to know through local Hammond Organ Societies, Stephen was appointed as Assistant to Keith Beckingham and George Blackmore at a time when Ena Baga, Bryan Rodwell, Hubert Selby, Len Rawle and Stanley King were regular visitors to the office. Stephen was then offered a job as demonstrator/salesman/in-house teacher at the famous Cavendish Organ Centre in London's West End. During this period, Stephen was able to spend lunch hours at the New Gallery Wurlitzer and Saturday mornings were "lesson time" with John Stewart at the Gaumont State Theatre, Kilburn and also continue classical organ studies through the Royal College of Organists although he dare not tell his tutors about his theatre organ activities! In 1974, Stephen moved up to Blackpool to go into partnership with organist and photography expert John Nunns and together they opened "Camera & Organ Centre" selling a wide range of photographic equipment together with electronic organs and keyboards and also famously stocking a vast range of theatre organ LP records - much visited by theatre organ enthusiasts when in Blackpool. Stephen is also quite busy on the concert scene and has appeared at various theatre organ venues including The Paramount Studios (Bolton), The Cannock Wurlitzer, The LTOT Heritage Centre at Peel Green, Stockport Town Hall, Ossett Town Hall, The Rex at Elland, Wolverhampton Civic Hall, Gosport, Blackpool's Opera House, Saltaire, Harworth, The Royalty at Bowness as well as a host of electronic organ societies. Married to Alex Wilhelm Coenen Sep 1919 in Rochford, Essex. The Coenen's were all musicians as well, from Holland. Played piano as part of the Bag A Tricks trio with sisters Ena Baga and Florence De-Jong. Played the The Kingsway Compton in 1960. Enas first cinema appointment was as assistant to her sister Florence De-Jong at the New Gallery Kinema, Regent Street. She went on to be soloist at the Tivoli, Strand where she remained for many years. Ena has the distinction of being the only lady organist to be invited to play for King George V at Balmoral Castle. Captain Arnold Bagshaw was born in Meersbrook, Sheffield. He joined the Yorkshire Dragoons Territorial Regiment as a bandsman, going on to be Bandmaster. He was the first resident organist at the Abbeydale Picture House, conducting the house orchestra from the organ bench. He then went to the Central Picture House as Musical director, again with a house orchestra. Ray Baines was born 20th April 1920. When he left school he took up accounting but decided he preferred music and at the age of 16 was accompanying Kitty Masters. Ray studied with Sydney Torch and started playing theatre organ at Union Cinemas. From there he went to the Savoy, Dublin then to the Capitol, Wembley. Ray completed another tour with Kitty Masters before returning to the theatre organ with Granada Theatres. After five years at Granada he joined Gaumont British. Don Baker was born in 1903 at St Thomas, Ontario, Canada. He played the Rivoli and Rialto, New York, then the Brooklyn Paramount & Staten Island Paramount. Don Baker toured England's Granada circuit in 1933, opening Empire Theatre Edmonton. He recorded at and broadcast from the Granada, Tooting. He was staff organist at Paramount New York 1935 onwards. Later was a demonstrator for Conn organs, and played at several pizza parlours in the 1960s and 1970s. Charlie Balogh is originally from Trenton, New Jersey. His interest in music began at age 11, at which time he started organ instruction. He studied with various teachers and eventually attended Trenton State College where he immersed himself in classical studies with Albert Ludecke. For a short time, he studied with Lee Erwin in New York. Charlie worked as a staff organist at Organ Stop Pizza in Phoenix, Arizona from 1973 until 1976. In 1977 he moved to Grand Rapids, Michigan to become organist at the Roaring 20's restaurant. In 1986 Charlie and his family purchased the business, which was renamed Good Time Charley's. He had his own radio program on WGHN in Grand Haven, Michigan. After 14 years at the console of the Wurlitzer, he decided to close the restaurant in September 1991. After closing Good Time Charley's, Balogh decided to move back to Arizona to play for Organ Stop Pizza, this time in Mesa, at their magnificent new restaurant which features one of the largest Wurlitzer theatre organs in the world. In addition to his schedule at the restaurant, he maintains an active concert schedule throughout the country and abroad. For eight years he was a featured artist at the Century II Civic Center in Wichita, playing the former NY Paramount Wurlitzer with the Wichita State University Jazz Band as part of the Wichita River Festival. In 1932 Doris Bamford trained at the Brussells Conservatoire and taught both singing and piano. August 1935 opened the Regal, Paisley. Alongside Gerald Shaw. She stayed on as resident organist. Gordon Banner was born 5th September 1911. He began to play the organ at the age of fourteen, receiving tuition from his uncle, the late Alfred Banner , who was organist and choirmaster of the parish church of Tipton, Staffs. It was Reginald Dixon who introduced him to the cinema organ in 1929, and in 1930 he went to America and made the acquaintance of Jesse Crawford. He appeared as guest organist at various cinemas in the U.S.A. In this country he has held appointments at the Ritz Oxford, the Commodore Hammersmith, and the Odeon Manchester. Gordon spent a number of summer seasons at Portsmouth. (Herbert) Clarence Barber was born 7th September 1903 in Bardsley, Lancashire. Was resident organist of the New Victoria, Bradford, for several years. He broadcast on the BBC Home Service from there. His broadcasting career certainly spanned mid 1938 to mid 1943, although an entry dated May 1927 was found in a Manchester newspaper. Clarence had many active interests in the city. He founded the Midday concerts at the Bradford Technical College in 1939, and gave many a pianoforte recital there. He also gave recitals to the Bradford Music Circle, of which he was secretary. He was a member of the Bradford City Police, whose musical talents were well known in Yorkshire. Jeff Barker was a native of Manchester, England, Jeff began piano lessons at age 5. He later attended the Manchester School of Music, majoring in piano. While still in his teens, his interest shifted to the Theatre Pipe Organ, and he joined the Theatre Organ Club and the Cinema Organ Society in England. He soon found himself playing 'Organ Interludes' at such places as the 'Carleton' in Salford, and the prestigious 'Odeon' in Manchester City Center. In 1962 he was he was playing Hammond at the Junction Inn, theatre organ at the Odeon, Sale and demonstrating at Cranes, Manchester. In the mid 1960's Jeff went to the U.S. to play a summer season at the Surf City Hotel on the Jersey Shore. He decided to stay in America, and subsequently became a U.S. citizen. Over the course of his career, Jeff played most of the important instruments of his trade in the U.S. and England, and was a featured organist at three American Theatre Organist Society conventions. Jeff served as house organist at theatres operated by Nelson Page in the New York Metropolitan Area for over 16 years. From 1999, Jeff played the Robert-Morton Theatre Pipe organ at the Palace Theatre in Lake Placid, N.Y.
Jeff passed away suddenly on December 31 2013. Highlights of his career include a 40 year residency of playing for dancing on several nights per week at St Peter's RC Social Club in Hazel Grove, Stockport, finishing in 2005. A 20+ year residency as organist of Stockport Town Hall, where as well as dancing, he played for Mayoral Making and other civic functions as and when required. In 1976, Eric made a strict tempo dance recording using the superb Wurlitzer Organ of the Gaumont Theatre in Manchester. This record, became the Lancastrian Theatre Organ Trust's top selling recording, a fact that is still true to this day. 'Ballroom Favourites' is now considered a major work of reference for ballroom dancers everywhere, and has been reviewed in America and Australia. Due to its enormous popularity, Ballroom Favourites was re-issued on CD in the mid 1990's. After he had personally initially sold over 1000 copies, Eric was awarded a special engraved tankard by the Lancastrian Theatre Organ Trust. Since making Ballroom Favourites, he has made other recordings and has been featured on radio and television. Eric is one of the very few professional ballroom organists who can play for dancing without the aid of a metronome (time keeping device) as he did with Ballroom Favourites. John Barnett comes from Willenhall, near Walsall in the West Midlands. During a visit to Blackpool Tower at the age of eleven, John became interested in and enthusiastic about organ music and was given tuition by a local organist. He was a church organist at the age of thirteen and also at this time played on occasions at the Majestic Cinema, Cradley Heath on its Christie Pipe organ. In 1989 John became one of the resident organists at the Motorcycle Museum, Birmingham, playing an electronic organ alongside the Wurlitzer for the popular Saturday Party Nights. while attending King's School, Chester. In 1933 joined ABC, in 1946 playing at the Savoy, Saltergate. While serving in the R.A.F. in India broadcast several times on the All-India Radio. He also did a considerable amount of camp concert work. Eugene Stuart Barrie was born 26th October 1898 in Louisberg, Nova Scotia, Canada. He was educated in Paris, Berlin, London, Kassel and Leipzig. Honour student at Beyor-Royal Conservatory. Doctor of music, Bachelor of Science in Musicology. Spent seven years as organist with Paramount Publix Theatre Corp., U.S.A. Five years as chief organist for Warner Bros, Vitaphone Corp. Theatre, U.S.A. opening the Mastbaum Theatre, Philadelphia then seven years with the B.B.C. Matthew graduated with a B.A. (Ed) Honours degree in Music and Education in 2002. In 2005, Matthew began to produce concerts known as "One-Man Musical Variety Shows".These shows feature Roland AT350c Organ, Yamaha P105 Piano, Weiltmeister Accordion and Vocals. Selection Foley Bates plays a selection during a concert at Arthur Russell's Studio in Malvern. Foley Lancelot Bates was the last of the pre WWII Midlands cinema organists. His last resident post was in the '60s at the Odeon in Birmingham playing the Compton there. His signature tune was 'I'll see you in my dreams'. He was born 26th Jul 1927. Along with Frederick Warrender opened the Rialto Cinema, Hall Green. Jack Bath was born 2nd December 1901, he studied organ under George Guest at St. Pauls Bournemouth. Between 1921 & 1935 served in silent picture orchestras. In 1935 he joined Gaumont British as organist, staying there until he was called up to join the R.A.F. in 1940. On being demobbed joined A.B.C. at the Regal Cinema Torquay. 1946 working for Associated British. GAUMONT-BRITISH Picture Corporation has received an invitation from the B.B.C. to permit the following resident organists of their theatres to broadcast on the new cinema organ at St. George's Hall. Mr. Bayco, organist of the Dominion Theatre, who will broadcast on the new cinema organ from 6.25 to 7 p.m. on October 30. Madame de Jong, organist at the New Gallery Cinema, who has been invited to play on November 6, from 9.40 to 10 p.m. Image © Successor rightsholder unknown. Frederic Bayco was born in 1913 in London. Best known for his Tudor pastiche 'Elizabethan Masque' other pieces include 'Lady Beautiful, and his marches 'Royal Windsor' and 'Marche Militaire'. Broadcast from the Dominion Theatre, Tottenham Court Rd. during the late 30s. He was still broadcasting. organ mot identified, through to 1947. Frederic Bayco died in 1970 in London. Ronald Baugh began his love affair with music as a 10-year-old Horwich schoolboy with piano lessons. By 13 he was the school pianist at Horwich Junior Technical College. He was introduced to the organ at Horwich Independent Methodist Church, and quickly progressed to playing Handel's Messiah from cover to cover. After school he signed on as an apprentice at Horwich Loco Works. But the lure of the bright lights of show business proved too much for trainee engineer - especially after a visit to the Tower Ballroom in Blackpool. Ron recalls: "I was hooked on the idea of becoming a theatre organist because the job looked so glamorous - you could wear a white tuxedo jacket, rise up from the depths in a blaze of spotlights for around three 15-minute periods a day, and people actually asked for your autograph. "You have to remember that back in the 40s and 50s organists were the pop stars of the day." But like most so-called 'glamorous' jobs, reality turned out to be rather different. It was hard work, although well-rewarded. As an apprentice he was picking up £6 a week but would earn £11 as an organist. b>Howard Beaumont was born in Halifax, Yorkshire.At the age of seven he commenced with piano tuition, later graduating to the organ. Howard was regularly featured on the popular BBC Radio 2 programme ‘The Organist Entertains’ and has made over 25 recordings. Dudley Beaven began his career as a chorister in Westminster Abbey, and leaving there he studied piano and organ at the Royal College of Music. One of his earlier appointments was as resident organist at the New Victoria Theatre. and with the Granada Three. Page pic = 4-9 Compton at the Odeon, Birmingham. c. 1980. 1946 working for Gaumont British. James Bell began his career, like so many of his colleagues, on a church organ, being taught by a blind organist whom he used to lead about. He was playing the organ at the parish church of Minnigaff at the age of ten. English, later Canadian pianist and teacher. Broadcasting from the Carlton Kinema, Liverpool in 1933. Made numerous broadcasts on the Light Program, Home Program and Forces radio up to 1947. In 1937 opened the Odeon, Leicester Square 1946 Playing the Odeon Circuit. Leon C. Berry was born in Alabama in 1914. He learnt to play the organ while still very young. While a student he took a job at the Hammond Organ factory. A Hammond salesman had sold an organ to a roller rink on the basis he would get someone to play it, Leon auditioned and was given the job. Leon went on to play pipe organs at a number of Roller Rinks, most notably playing the theatre organ at The Hub roller rink where he resided from 1950 to 1967. His reputation earning him the title Dean of Roller Rink Rock. Leon Berry was a name familiar to those enjoying the new stereo LPs, Leon released many records that were very popular at the time. The tone of the theatre organ suiting the new recording medium. In 1953 Leon released his most popular recording, 'Misirlou' it reached No. 6 in the Billboard magazine charts. Leon installed a theatre organ in the basement of his home, he called it 'The Lion'. All subsequent recordings were made on this instrument. Harold Betts opened the Granada, Bedford. In the newspaper report of the occasion it was mention that Harold was only 5' tall. In 1948 playing piano at ABCs Popular cinema Derby. In 1929 Cyril Birmingham opened the Elite Picture Theatre, Nottingham. George Blackmore was born in 1921 in Rochester, Kent. He commenced his musical studies as a chorister, attending the Cathedral Choir School. At the age of 12 he became the youngest ever to win the organ scholarship at King's School, Rochester. George developed an interest in the theatre organ and after playing the Compton at the Palace, Chatham he began occasional deputy work at the Compton in the Majestic, Rochester where he finally became organist in 1939 and made his first broadcast in 1941. In 1946 he took up the post of organist at the Gaumont, Birmingham. However, the Rank Organisation who now ran Gaumont and Odeon theatres began to make cuts in the numbers of circuit organists and in February 1950 George found himself out of a job. George spent seven years in Aberdeen as organist at the Astoria and the Capitol, broadcasting frequently and also acting as Musical Director for Donalds' other live entertainments. He also held the post of organist at St John's Episcopal Church. Soon he returned to full-time organ playing, initially as demonstrator for manufacturers of electronic instruments (In 1968 he joined the Hammond Organ Co.
His death in 1994 robbed the organ world of one of its most popular and talented figures. Extract:- Aberdeen Theatre Organ Trust OrganFax page. Ray Bohr was born in Nyack, New York on 2nd November 1919. He started playing piano at six but he really wanted to play the organ. By the age of 14 Ray was working for a local organ builder. Ray took classical organ lessons at St. Johns church, Greenwich village and Wulitzer lessons at the Rockland Theatre Nyack. Ray served in the Army Signal Corp during WWII. after the war he worked for the Wurlitzer company as a demonstrator. Ray Bohr released two albums under the name of Van Talbent. Ray Bohr went on to be the Radio City organist. and was at the same time helping his parents to run a sweet shop, and teaching children to play the piano. In 1924 he started playing in the orchestras of luxury steamships. He began to study the organ when in America at a time when cinema organs in that country were just becoming the rage. Returning to England Bollington got an appointment with Spiero's orchestra at the Tower, Blackpool, and he later obtained his first solo organist appointment at the Streatham Astoria. He was there for five years, spent two years at the Plaza, Piccadilly Circus, and succeeded Reginald Foort at the Paramount, Tottenham Court Road. In 1937 he opened the Paramount cinema Birmingham He has given a number of broadcasts on the Paramount organ as well as transmissions from the BBC Theatre Organ. Reginald Albert Bolton was born 16th October 1907.
educated in Bath, Somerset:Christ's College, Cambridge: in 1870:St Catharine's College in 1871. Graduated B.A. in 1874 and M.A. in 1877.
at Rochester Cathedral. He held church organ appointments in London until 1936. Reginald the joined Gaumont British as a relief organist at the Regal, Leamington Spa. In 1938 joined A.B.C. as resident at the Regal, Handsworth. He was playing at Leamington Spa in 1939. Spent ten years playing for Gaumont British as solo organist. Moved to Palace Theatre, Long Eaton as M.D. and organist. Edwin also played at Scala Theatre, Long Eaton; Regent, Bristol, Coliseum, Burslem; Savoy, Leyton; Super Cinema, Stratford & Lonsdale, Carlisle. During the German occupation of the Channel Islands W. Kennedy Bott was organist at the Regal Cinema. Along with the cinema manager they had an illegal all-mains (wireless) set concealed in the console of the Compton organ. Twice daily, when the organ came up to be played, the forbidden set was on full display in front of about 700 Germans, and not one of them saw it. 1946 Playing the Lou Morris Circuit. Born and educated in Wigan, Lancashire, Blackpool Tower organist John Bowdler has been playing the organ since the age of 8. He has been one of the team of resident organists at the famous Tower Ballroom since 1987, a position he took up at the age of 16 straight from school. In addition to his commitments at The Tower, John also travels the length and breadth of the country undertaking concerts for organ societies and social groups as well as playing for dance events. He also makes several appearances at organ festivals across the UK. It's A Pity To Say Goodnight. Josephine Bradley MBE was born on the 4th March 1893 in Dublin. She was better known as a dancer, dance teacher and ballroom orchestra leader, competing with Victor Silvestor both on the dance floor and on the orchestral podium. On the 15th September 1930 along with Charles Willis she opened the Granada, Walthamstow. Josephine Bradley died 16th February 1985. Ronald Brickell was born 4th September 1902 in Bournemouth. He studied organ and pianoforte under Enos J. Watkins. in Bournemouth for twelve years. He performed with his own band at leading hotels and country functions. Performed before Queen Mary. In 1935 studied theatre organ under Terence Casey. Went on to be assistant to Frederick Baycoat the Dominion, Tottenham Court Road. In 1937 became solo organist for Gaumont, Haymarket; and played every Gaumont British organ in the West End. Frederick John Bridgman was born 11th June 1896 in Reading. Was admitted as a chorister to Westminster Abbey staying until 1911. Last official duty taking part in the coronation service of George V.
Countess of Craven, at Ashdown Park, Shrivenham. Joined up for military service in France with the Military Transport section. On being demobbed in 1919 returned to Ashdown Park. Saw a girl he wanted to marry so moved to Manchester, playing a Mustel harmonium. In 1921 joined Rhodes Pictures Ltd, Manchester staying for six years. In 1927 moved to Futurist Theatre, Scarborough. In 1932 was engaged to open Savoy Cinema, Cork, staying for 13 years. He then moved to the Gaumont, Lewisham. Did a number of broadcasts on Radio Eireann. Noel Briggs was born on the 9th January 1920. He received classical organ training with Mr. F. Keal. He made his first theatre appearance at the age of 17 during a series of concerts at the Queens Hall, Grimsby. Noel Joined A.B.C. when he was 20 and went on to hold resident positions at Ritz, Scunthorpe; Savoy, Lincoln; Savoy, Leicester; Ritz, Cleethorpes and Regal, Grimsby. Norman started piano lesson aged seven taking up organ while working for an organ builder when he was fourteen. Sidney PhaseySydney Phasey had a musical background, his uncle having been one of the world's champion trombone-players, and his grandfather both a member of Queen Victoria's private band and a professor at the Kneller Hall Academy. Sydney himself had been in charge of orchestras at several big towns in the North. In 1928 he became director of the Bristol Hippodrome Orchestra, with whom he first broadcast in September, 1938.
and his orchestra at the New Victoria, Bradford. Other cinema appointments included Regent Theatre, Hanley; Theatre Royal, Halifax; Gaumont Cinemas in Derby, Sheffield & Norwich and New Victoria & Ritz, Bradford. He also gave numerous broadcasts on the BBC organ. Norman Briggs died in 1973 in Bradford, Yorkshire. Harold Britton was born in Bristol and studied music/organ at the Cathedral under Clifford Harker, later taking tuition from Dr Harold Darke. In 1966 he was invited by Fernando Germani to attend his organ class at Accademia Musicale Chigiano in Siena. The following year Harold studied the works of Marcel Dupré together with the composer in Paris. Harold held the post of Civic Organist of Walsall for over 40 years. He has given recitals in most of the county's principal cathedrals and concert halls. These include St Paul's Cathedral, Westminster Abbey, Westminster Cathedral, Hereford Cathedral, the Royal Albert Hall, Colston Hall Bristol, Broadcasting House and St George's Chapel, Windsor. In addition he has participated in the Ely Cathedral Organ Festival and given an extensive series of recitals at Birmingham Town Hall. His numerous performances at Notre Dame Cathedral in Paris have been acclaimed by audiences, organists and composers alike; it was as a result of one of these recitals that he was invited to serve on the jury of the Chartres International Organ Competition. International recital tours have taken him to France, Germany, Czechoslovakia, the former Yugoslavia as well as Australia and the USA. 1946 Playing the Granada Circuit. Ernest Broadbent was born 22nd of December 1910 in Oldham England. Ernest married Dorothy Pickard in 1934. From 1948 to 1952 he was accompanist to Joseph Locke. In 1952 Ernest joined the Blackpool Tower Company, playing Hammond organ with an orchestra in the Pavilion Theatre and solo in the Tower Lounge. In 1966 he became resident on the Empress Ballroom Wurlitzer and also played the Opera House and Tower Ballroom Wurlitzers. In 1970 Earnest Broadbent took over as resident organist at the Tower Ballroom until ill health forced him to retire in 1977. Norman Brooks was born 22nd April 1913. Musical training at Associated Royal College. Started his organ career at the Baptist Church, Sittingbourne, in 1931. Conscripted in 1940. N.C.O. in charge of the Unit Orchestra and Corps of Drums. Toured South West England and Northern Ireland. On Demobilisation took a position at Tonic Cinema Co. Down. Also played the dance hall circuit. Like many organ enthusiasts, as a young man, Charles Brown became captivated by the broadcasts of the legendary Blackpool Tower Organist Reginald Dixon. Although music hasn't been his full time profession, Charles's musical career has nevertheless been an extensive one. From his time playing the Compton Organ of the Davenport Theatre in Stockport, to his long residency in command of the Stockport Town Hall Wurlitzer Organ, Charles's musical experience is both varied and interesting. In the 1980's Stockport was unique in having two Compton Theatre Organs in their original homes and playable. Charles would feature the Compton Organ of the former Plaza Cinema, then a bingo hall on a Saturday evening, and then travel up the road to the Davenport Theatre and play for the film shows. Playing the organ at the Davenport gave Charles rare experience of playing an original cinema organ in a venue that was little changed from when it was opened in the 1930's. In the late 1990's Charles was introduced to Eric Barlow, then resident organist of Stockport Town Hall. Charles is appreciative of the guidance he has received from Eric, in regard to the special technique required for strict tempo playing. As Eric had indicated his desire to retire from the Town Hall, Charles began to share the alternate Monday night dances with Eric, eventually taking over as resident organist upon Eric's retirement in 2000. With 15+ years of playing the Stockport Town Hall Wurlitzer Organ twice a month, Charles has notched up well in excess of 300 appearances at this organ. Max Bruce opened the New Imperial Cinema, Canning Town in 1939. Kevin Buckley was organist at the Regent, Bournemouth (Broadcasting from here in 1930) and Picture House, Glasgow. He made regular broadcasts from the Regal Glasgow. In 1934 he opened the Forum Cinema, Northenden. For 22 years, from 1970 onwards, Frank Burrows was the resident organist at Scunthorpe's Woodland Crematorium. But he was best known to thousands of young cinema-goers as Uncle Frank - from his days as the resident organist at the town's former ABC and Ritz cinema on Doncaster Road, Scunthorpe. During the Second World War Frank served with the RAF in the Middle East. Built by Cammell Laird 1922 for Cunard Line. English bandleader and violinist. Ambrose became the leader of a highly acclaimed British dance band, Bert Ambrose & His Orchestra, in the 1930s. Thanks to Ms. Anne Maxwell for this information. Extracted from her fathers personal diary. On being de-mobbed in 1945, he took the job as the resident organist at the cinema. In the 1950s he became the star of the Saturday morning ABC Minors' Club when thousands of children paid two-and-half-pence to join in a sing-a-long and watch cartoons and serials. On one occasion he was made the VIP guest at a reunion of former Minors. But for more than 40 years he played at weddings and parties in North Lincolnshire and he was the resident organist at many local clubs and pubs. His music brought pleasure to thousands of local people. He continued working as a piano tuner until he was almost 90 years old. Frank Burrows was regarded as one of the top piano tuners in the country. At one time he was called in by staff at Blackpool Tower to tune the piano played by Reginald Dixon. John Cyril Busfield was born 6th October 1897 in Calverley, Yorkshire. at the Grove School, Apperley Bridge, Yorkshire. His first organ appointment was playing in church performances aged 15. He was organist and choirmaster at Bradford Church until he was called up for military service. He served with the West Yorkshire Regiment, played clarinet and acted as concert party pianist while in Cologne. His first cinema appointment was on a two manual harmonium accompanying silent films with an orchestra, often acting as conductor. On introduction of the talkies returned to playing the organ, and went on to play all types of organ including the Hammond. Played to Royalty at the Dome Brighton, then went on to play at Gaumont, Chelsea. He also played the Astoria Theatre, Brighton. Died December 1977 in Wharfedale, West Yorkshire. Michael Carr, at the age of fifteen, paid for ten lessons at his local organ shop and never looked back. He has played for strict tempo dancing and backed singers around the local clubs for many years. The Scarborough Fair Collection has become one of his regular commitments, playing the Wurlitzer for dancing and entertaining each week. 1945 playing at the New Palace Bristol. Gaylord Beach Carter was born August 3rd, 1905 in Wiesbaden, Germany. His father was a church organist and taught music, while his mother taught voice. His family emigrated to the United States, settling in Wichita, Kansas, where his father opened a conservatory of music and also served as a church organist. Young Gaylord displayed the family talent for music and became a soloist in a church choir. He also played the organ in another church from the age of ten. As the "Jazz Age" evolved, Gaylord found himself drawn to the new musical form and dared to try jazz on the church organ.By the time he was fourteen Gaylord was playing at a local movie theatre, accompanying the silent films at children's matinees. The family remained in Wichita until 1922 when they moved to Los Angeles, California, where 16-year-old Gaylord was enrolled at Lincoln High School in the Lincoln Heights district. Gaylord found employment at a local theatre accompanying movies on the piano and then, as the theatre prospered, a new Estey organ. After graduating from Lincoln High, he attended UCLA where, by 1926, he was engaged in pre-law studies. He continued playing in theatres to finance his education. Gaylord Carter was spotted by an agent of the Harold Lloyd Company. Impressed by the description of Carter's playing, Lloyd recommended him to Sid Grauman, who offered the 21-year-old $110 a week to be the full-time organist at his downtown Los Angeles movie palace, the Million Dollar Theatre. Through the remainder of the 1920s, Carter played at the Million Dollar and other theatres. The introduction of sound films, and then the onset of the depression, led to a declining demand for theatre organists, and by the mid-1930s Carter had launched a career in the booming new medium of radio. He played on several network shows and also had his own local music show on Los Angeles station KHJ. In 1936 Carter became the staff organist for the hugely popular Amos N Andy radio show, a position he maintained until entering the Navy in 1942. Gaylord spent the war years serving in the Navy as a film officer in Alaska. Following the war he resumed his radio career. He then moved on to television in the 1950s where he was the musical accompanist on the Pinky Lee Show. In 1961-1962 Carter had another local show of his own, "Everybody Sing with Gaylord" on Los Angeles channel 13 KCOP-TV. Gaylord Carter remained active into the 1990s. He made tours of North America, Europe, and Australia, performing on many of the world's surviving theater organs. Gaylord Carter died peacefully in his home overlooking the Pacific ocean at the age of 95.
b>Michael Carter started learning to play the organ following a visit to Blackpool Tower, aged nine. Michael was mesmerised by the sound and remembers deciding there and then that he wanted to play that instrument. Within a few years of hard work and with tutorage from Midlands Cinema Organist, Foley Bates, he returned to the Tower and achieved his ambition to play the famous instrument. Throughout his teenage years he worked weekends and school holidays in local music shops and continued with his lessons in theatre style whilst developing his own approach on electronic. Michael started performing for concerts, dancing, and local events. Throughout this time he owned many instruments and most performances were either on his Hammond M102 or latterly a Yamaha HS series. His love for theatre organ remained and Michael performed a number of concerts alongside his teacher as well as solo events. Terence Casey trained at the London Academy of Music, intending to become a conductor of opera. After some years in church work, he took to cinema organ playing in 1914; went to America after the war, and returned to play at the Regent Theatre, Brighton, where he remained for ten years. He joined Provincial cinematograph theatres and was organist at the Gaumont Palace, Chelsea. He broadcast regularly on BBC radio and produced many records. Opened the Palace Cinema, Chatham; Gaumont Palace, Camden Town; Gaumont, Bromley. Cecil Chadwick was born in Middleton, Lancashire. He studied under Fred Forrest & Dr. G. Wilmot Cooper. Cecil worked in a cotton mill from the age of 12. Joined the Manchester Regiment in 1914 and served in France, Belgium and Italy until February 1919. On demobilisation started work as a pianist at the Palace Cinema, Middleton, he played there for eighteen months. Cecil then went to the State Cafe, Manchester. Cecil left Manchester c.1923 to be musical director at the Palace Cinema, Southport where he stayed for seven years, when talkies started. Took his first organ appointment at the Plaza Cinema, Stockport in 1932, opening the cinema, He resigned on July 1st to take up a post at the Classic Cinema, Belfast. He started broadcasting from there on 24th July 1933 and by July 1934 had made 100 broadcast. Cecil resigned in 1936 to join Union Cinemas for a year, he then moved to the Savoy, Leicester and then in 1938 moved to the Paramount, Leeds. Doreen Chadwick was born 7th August 1918 in Maesycoed, Pontypridd, South Wales. Doreen started playing the piano aged seven and then organ at sixteen, on one of the earliest organs installed in Wales. The Palladium, Pontypridd. Studied straight organ and won the organ solo at the Carmarthen Eisteddfod. She also won four gold medals at the Reading Music Festival. At 17 she did her first broadcast. Her first post was at the Rex, Aberdare. After two years she decided to try her luck in London. She was taken on by Granada Theatres and appointed to the Granada, Tooting Doreen was with Granada for three years before moving to the Savoy, Leicester then the Ritz, Richmond. Henry Alban Chambers was born 14th June 1902 in Leeds. He studied at St. Michael’s College, Leeds. Raymond Charles was born 16th Jul 1908 at Herne Hill, London. As a boy he played at All Souls Church, Camberwell, became organist to Camberwell Grammar School two years later. Raymond studied at Trinity College London and was a pupil of Professor Edward d'Every. Raymond became a senior student and pupil teacher at Trinity College. He held several posts as organist and choir master in South London. Became a theatre organist in 1926. Held appointments with Provincial Cinematograph Theatres, Paramount, and Associated British Cinemas. Commenced broadcasting for the BBC in 1930 from the provincial Paramount theatres. From 1938 to 1941 was resident at Savoy, Northampton. Joined the R.A.F., formed and toured R.A.F. dance orchestras and camp shows. After demobilisation in 1946 returned to Associated British Cinemas and became resident at the Savoy, Stoke Newington. When he left the organ side of the business and went to cinema management he was known as Charles Raymond. pseudonyms were often used by players to allow them to record for other record labels. Obviously if the contracted record company found out there would be big trouble so no photographs of the player were ever on the record cover. Some record companies had strict rules that covered what could and could not be recorded by an artiste, if an artiste enjoyed playing a bit of jazz but the contract didn't allow it they could record a jazz album for another record company without the original company knowing. Satisfying there inner creativity and putting a bit more cash in the bank. Soorjo Alexander William Langobard Oliphant Chuckerbutty (A.K.A. Wilson Oliphant) was born 1884 in the county of Kensington, London. H Robinson Cleaver was born Harold Arthur Robinson in Eckington, Derbyshire on May 25th 1906 and by the age of nine he was organist at Bramley Parish Church. He took his first cinema organ position at the Albert Hall in Sheffield and commencing studies at the Royal Manchester College of Music where he gained his ARCO degree at the age of 21. From Sheffield he moved to the La Scala cinema in Hyde, Greater Manchester, here he met Molly Bailey, who was the pianist, she became Mrs Robinson (Cleaver) in 1930. It was at the Piccadilly Theatre in Manchester that Robbie first got the idea of adding 'Cleaver' to his name after seeing the large, and then well known, department store 'Robinson and Cleaver' opposite the Piccadilly. After four and a half years at the Piccadilly, Robbie moved to his first unit organ position on the Christie organ of the Lonsdale Cinema in Carlisle for the Sidney Bacon circuit. He arrived at Bexleyheath in late 1935 and began broadcasting weekly from January of 1936, cutting two 78rpm discs for the Octacros label before signing a recording contract with Parlophone. Robbie joined Granada Theatres in early 1938 and made his first broadcast from Clapham Junction Granada before being chosen to play for the opening of the new theatre at Welling in Kent. Recording and broadcasting continued at Welling and later at Tooting Granada, after which he recorded the Compton organ at EMI Abbey Road studio, both solo and in combination with other soloists, orchestras and dance bands, most notably with Billy Thorburn's band under the title 'The Organ, The Danceband and Me' as well as session work, often un-named, both for EMI and Decca using their Wurlitzer organ at Hampstead. Robbie stayed with Granada until the cuts of 1958, he then formed a new music publishing company and produced weekly shows and Sunday concerts at Teignmouth and at the Odeon Llandudno. He then did a ten-year stint playing summer seasons at Bognor Regis and Scarborough with winters at Richmond Sportsdrome. H Robinson Cleaver died on July 23rd 1987. He designed a Military Band Organ with 9 keyboards in 1913. In 1921 he was organist at Blackpool Winter Gardens. David Clegg died 31st October 1923 in Blackpool, Lancashire. b>Rosalind Clynes was born in Dublin. She studied piano and organ at the Royal Irish Academy of Music under Dr. George Hewson. 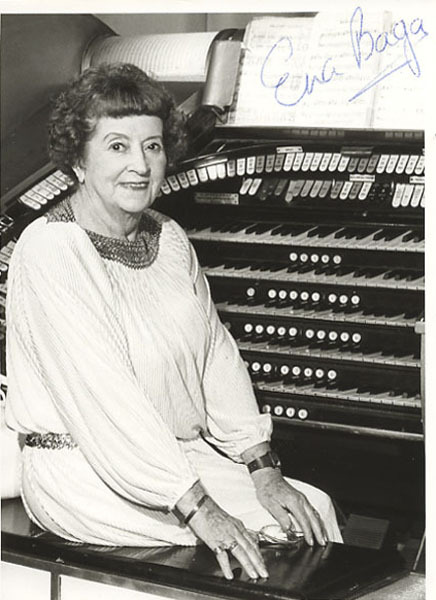 Rosalind received her first theatre organ lesson from Sidney Gostard at the Trocadero Cinema, Liverpool. Her first cinema organist appointment was at the Savoy Cinema, Dublin. She had the distinction of being the first lady organist in Ireland. Her musical career was temporarily halted when she married a doctor. The war intervened and her two boys were evacuated and she was persuaded to return to the theatre organ. Although primarily known as a pianist, he had an abiding love for the organ, both Hammond and theatre organ. He worked extensively with Henry Mancini, who used his distinctive Hammond organ sound for the sound track to the TV series "Mr. Lucky". He also recorded several albums for Warner Brothers records on piano, Hammond organ and theatre pipe organ. He married Yvonne King, member of the King Sisters, They had two daughters, actress Tina Cole and Cathy Cole Green. Don Compton opened the Crescent Cinema, Leatherhead. Playing a Hammond LaFleur organ. Charles Cooksey was born in 1909. He studied organ and violin theory at the Guildhall School of Music, became organist at a Sydenham Church and to the Sydenham Choral Society. His first cinema organist appointment was at the Prince of Wales in Harrow Road, he left after six months and became musical director at the Grand Cinema, Holloway Road. In 1930 he joined Francis Day & Hunters show at Clacton. At the end of the season he moved to the Old Cornet, Notting Hill, playing a Jones' organ, while there managed to practice on the organ at the Palladium, Shedherds Bush. His first cinema organ job was with County Cinemas in August 1931, playing at Staines, Wembley. January 1934 he was at the Regal, Canterbury. In 1934 he left to work for Granada but left them to work at the Corona, Leigh 0n Sea. He joined the R.A.F in 1940, accumulating 1800 hours flying with Coastal Command. Harold Coombs was born 1903 in Abbeydale, Sheffield where he began his musical career in his early teens as a 'wonder boy pianist' and became a church organist at the age of 14. He played at the Abbeydale Picture House, Sheffield where for 11 years he had played a 'straight' silent film organ. He then moved to the Capitol cinema, Aberdeen. In his first appointment at a 'modern' theatre organ he immediately realised the importance of absorbing the Scottish idiom, adopting as his signature tune the Scott Skinner air 'The Bonny Lass of Bon Accord'. The gusto with which he delivered his livelier numbers earned him the affectionate nickname of 'bouncing Harold' among his Capitol colleagues. He gave more than 50 BBC broadcasts from the Capitol. His farewell performance was on Saturday 27 November 1937 and he then moved to the new ABC Westover Cinema, Bournemouth. From 1939 until 1942 he played at the ABC theatre in Woking and Aldershot, also entertaining at the army camps there as part of the war effort. Always a popular and well-respected figure, he became Borough Organist of Bournemouth in 1946 and presided at the Bournemouth Pavilion's large dual-purpose Compton until he retired in 1962. Jack Coombs was born 5th October 1913 in St Helier, Jersey. He studied with Leonard Herivel. For two years he accompanied the Jersey Male Voice Choir. He was deputy organist at Gt. Union Rd. Methodist Church. In 1939 Jack led his own dance orchestra playing Hammond organ at the Plaza Ballroom. During the German occupation became resident at The Forum Cinema. Specialised in playing dance music on a Hammond. Became resident organist at The Regal Cinema, Ilford. 1946 Playing the Odeon Circuit. Jack Courtnay was born John Ferguson Taylor (brother to Alex Taylor) on the 14th September 1895 in the parish of Garturk, Scotland. Taught to play the violin and piano by his father. Gained an open scholarship to the Glasgow Atheneum School of Music. Appointed to Coatdyke Parish Church when quite young. Ran away from home and joined the Royal Scots Fusiliers. 'bought out' by irate father after six weeks. Then went to work as a pattern maker at an iron foundry. Then worked on the railways as a weighing clerk, then disappeared back into the armed forces and enlisted in Royal Marine Bands. Appointed organist at the Shotley Barracks Training Establishment. On the outbreak of war joined H.M.S. Implacable. History was made when the squadron was hove to so the brothers could have a conversation. At the time Alex was on H.M.S. Cornwallis. After service in the Dardanelles John was discharged disabled. John emigrated to Toronto, Canada, started working in a bank, quit to play in a Nickleodeon, was appointed to play Loew's Theatre and Winter Garden. Having heard a Wurlitzer took a job at Allen's Beaver Theatre (for lower pay). Toured Canada, opened Capitol Theatre, Winnipeg. Left there to take a position at the State, Minneapolis. Returned to the UK for a holiday, took a job as a tram conductor in Bournemouth. Was inducted into making valves for submarines, had to retire as only one in ten were serviceable. Ended up washing bottles in a Bournemouth brewery. Returned to the USA where he opened at Loew's Lexington, then toured. Returned to the UK and introduced the first slide solo at the Kings Theatre, Sunderland. Opened the first five Wurlitzers in the UK and was responsible for introducing Reginald Foort to the Wurlitzer. Returned to America and located in Florida and held a number of appointments. Broadcast regularly on W.I.O.D., W.T.O.C. and W.J.A.X.. Opened the Wurlitzer at the De Soto Hotel, Savana. When the slump hit ran one of the largest chicken farms in Florida. Back to the UK to work for Southend Council. Returned to cinema organ playing in 1943, opening at the Regal, Old Kent Road. Appointed musical contributor to Kinema Weekly and Ideal Cinema in 1945. In 1946 published Theatre Organ World. English-born American composer and conductor. Known for his film music compositions, which were written for many animation, documentary, and feature films from Walt Disney Studios. he learned about the then new types of theatre organ sounds. In the 1920s Crawford began forming a fan base and was dubbed the 'Poet of the Organ' for his style of playing ballads in Chicago. In 1921, he was employed by the Balaban and Katz theatre chain playing its 29-rank Wurlitzer in the Chicago Theatre. Henry Croudson was born 13th Nov 1898 in Leeds, West Yorkshire. Originally a bank clerk working for the Midland Bank, Leeds, gave up counting notes to take up playing them. After seven years at the Majestic, Leeds joined Paramount playing Leeds, Manchester, Liverpool and Glasgow to name a few. Commenced broadcasting while at Leeds in 1934, went on to make over 300 broadcasts. Made twenty four double sided albums for Regal-Zonophone while at the Paramount, Manchester, just prior to the war. After being Blitzed in Liverpool he gave up playing and became a publican at the Ship Inn at Briggate, just across the road from the Paramount cinema. After a month behind the bar he was asked to go back and play at the Paramount, which he did. After the war he went on to play at the Gaumont, Haymarket. In 1959 Henry decided to give up regular cinema organ recitals and returned to being a publican, this time at the Red Lion in Nazeing, Essex. He took with him his Selmer Electronic Organ, with which he entertained the customers. Henry died 30th Nov 1971 at St Margeret's Hospital, Epping, Essex, England. As a young man Ronald Curtis was employed by the John Compton Company. He developed a working knowledge of organs that enabled him to go on to become an organ builder himself. As well as being a concert artist he made many recordings on both pipe and electronic organs and broadcast numerous times. Ronald made two trips to the USA visiting Detroit, Rochester, Syracuse and North Tonawanda. R. Hill Cutler 1934 - 1939 Resident at the Kings Theatre, Dundee. As well as playing the theatre organ he was also playing other organs in the area. Some of Frederic Curzon compositions performed by various orchestras. Frederic Curzon was born 4th September 1899 in Lambeth, London. Frederic studied piano and violin from the age of 9, and became pianist in a small orchestra at 16. After the 1914-18 war became musical director of a cinema in the West End of London. Eventually turning his attention to the organ, became one of the first demonstrators of the then new electronic organ. Went on to succeed Quentin Maclean at Shepherds Bush Pavilion, remaining there for eight years. Frederic then spent twelve years with Gaumont British playing at all their largest London theatres. Frederic had been composing music since 1920 with some success. When his health started to fail it was logical for him to give up public performance and devote his time to composition. He was put under contract with Boosey & Hawkes and went on to write many popular pieces of music. Frederic Curzon died on the 6th December 1973 in Weymouth, Dorset. Basil James Rollo Cuthbert was born 30th March 1912 in Sibford, Oxfordshire. A student at King Alfred's College, Winchester. First appointment at the Regal, Winchester from 1931 to 34. Then the Majestic, Reigate from 1934 to 37. followed by the Embassy, Waltham Cross. Basil joined the A.B.C. at the end of 1937 and played their cinemas at Horsham, Chatham and Hastings. Joined the R.A.F. and while in service broadcast from the Regal, Torquay & Regent, Leamington Spa. Basil Cuthbert died in 1994 at Oxford, Oxfordshire.